I've always been curious about dry shampoo but never committed to trying it. 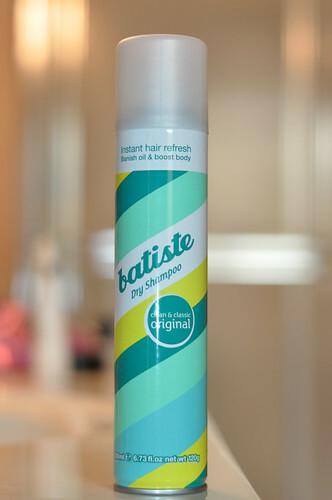 After weeks of research and countless hours of web surfing, I decided to give the Batiste Dry Shampoo Original a try. The online reviews were right, this dry shampoo is amazing. I have thin hair, and if I don't wash it every day, it gets oily. Well, I don't need to do that anymore. To use, just simply shake the bottle and spray onto oily parts of your hair. It will leave a white powdery finish to your hair at first but don't worry. Leave on for a couple of minutes then brush out. It gives my hair the most fantastic instant volume. Using dry shampoo is a super easy and quick way to give your hair a boost. It smells fresh and the price can't be beat. I highly recommend this product to those who'd like to give dry shampoo a try. Got my new personalized iPhone case a month ago and absolutely love it! One of my summer essentials is sunblock. 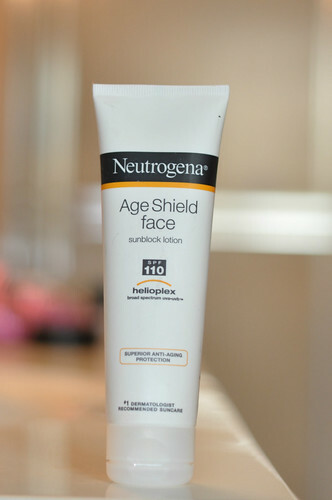 On a recent trip to my local drug store in search of a new one to try, the Neutrogena's Age Shield Sun Block caught my attention because of its high SPF of 110. I've been using it for several weeks now and am very pleased with the results. This sunscreen provides excellent coverage and has not caused any sensitivity issues on my skin. The lotion is pretty thick but blends seamlessly. I wear it daily under my make up, and it provides very good moisture as well as sun protection without white cast and no oily face. As mentioned here, I've been experimenting with different colors of lipstick lately. I picked up this NYX matte lipstick in summer breeze at Ulta a few weeks ago and have been wearing it quite a bit. 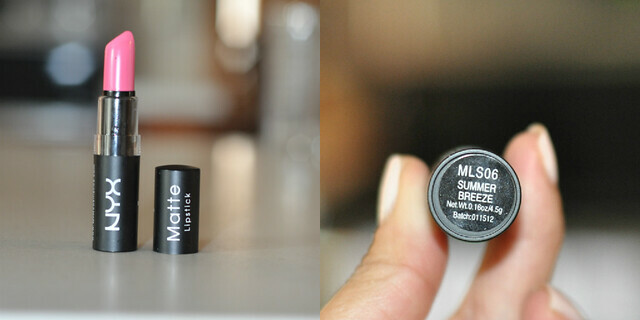 It is highly pigmented and glides on smoothly. Although, I'm not really a pink lipstick kinda girl, I must say this color definitely has that pop of color I was looking for. Overall, it's a great shade for summer! Maybelline recently launched a brand new line of 40 nail polishes in their new Color Show collection. I picked up “Born With It” and “Green With Envy” after reading so many raved reviews. These nail polishes are absolutely amazing! Maybelline Born With It is a very pale pink (very similar to the Essie Fiji that I love). The formula was great and very easy to use. Although, it would take 3 coats for the color to show. I've been a fan of mint green on the nails since it became quite popular as of late. I picked up the Revlon Jaded a while ago and wasn't too impressed with the color. Maybelline Green With Envy is a gorgeous bright turquoise green cream. The shade is exactly what I am looking for. Both are easy to apply and fairly quick to dry. Best of all, they're super affordable. Readers, have you tried any of these products? Hi Sydney, hope you are doing good. I caught a glimpse of your tweet about the placenta, but not sure what that really means. Hope there is a way to correct it. NYX is my favorite lipstick brand but I don't have that color - I'm going to have to get it! Saw Vicky's email above - do you placenta previa? Eveyrthing ok? I had that too - but it was ok by my third trimester. Email me if you have any questions - always here to help!! My hair is the same. Thin hair and have to wash it everyday. I use suave dry shampoo once in a while and am quite happy with it. Great to know things you love now! Never tried dry shampoo, maybe no need since I have really thick hair. Love your lip color and those nail colors. So cute! I've used dry shampoo on occasion and still can't get mentally past that I haven't washed it. My hair is thick and oily, maybe that's why. SPF 110! You are covered ;). And great polishes from Maybelline! Good coverage? AND OMG about the placenta tweet?! Hope you and baby are ok! Thank you for the dry shampoo recommendation. I need to try that out. I have thin oily hair too. I love the nail polish color. I hope you and the baby are well. so i'm pretty much obsessed with dry shampoo. i've used batiste too. the "brit" version. i really really like it. however, i've found that the got 2 be brand also does the same trick for about $2 cheaper, if you buy @ walmart. However, I d k where you get your Batiste, but I suppose it could also be a good deal if you have the $3 off of $10 from Ulta, which is where I got my Batiste. Via tiff from i am stylish, i tried Pssst. However, it left a stiff feel in my hair, so I've reverted back to got 2 be. I've tried so many...again...obsessed. sauve original DS. sauve keratin DS. got 2be. dove (DO NOT TRY or read reviews first on makeupalley.com), oscar blandi orig DS, oscar blandi dark hair DS, batiste, pssst, not your mother's, got 2 be collagen. there are so many out there. hahahah, i seriously love DS. it's made a big difference when trying to grow out your hair, at least w/mine. also i've delved into dry conditioner, but i've only seen 2 kinds. I like it for my ends, but you can also use a shine serum and get the same results, however, i prefer the fine mist of oil. furthermore, i also used to use the neutrogena face spf 110. the melanin on my face litearlly never darkened the whole summer. hahahha. it's terrific if u want to keep ur face the same color in the winter. but i used it too much and my friends made fun of me for being ghostly white so this year, i downgraded to spf 55 & learned to use matte bronzer. NYX is awesome. i call it the cheap-man's MAC. Love those mint and blush nail colors! So fresh! Thanks a bunch for your sweet comment, Sydney!